On this date in 1794, the French artillery general Jean-Pierre du Teil was guillotined at Lyon. The baron du Teil (English Wikipedia entry | French) numbered among many ancien regime officers whose talents were needed but allegiances were suspect in the citizens’ army of revolutionary France. Such figures were forever vulnerable to attack as secret royalists; du Teil while serving in the Army of the Alps fell prey to that very charge made by the ferocious Jacobin rulers of Lyon, Collot d’Herbois and Joseph Fouche. He’s noteworthy to posterity as a mentor to the young Napoleon Bonaparte at the Royal Artillery School of Auxonne. Du Teil took notice of the precocious teenage artillerist and honored him with special assignments — “a mark of unheard-of favor,” Napoleon gushed in private correspondence. On this date in 1796 the Polish outlaw Jerzy Procpak was executed. Anticipate Polish in all links to follow. It takes a stretch to reckon this avaricious cutthroat as a social bandit; nevertheless, he’s chanced to a fair measure of historical renown as an exemplar from the dying age of highwayman. He supposedly turned to crime after being punitively thrown in prison for shooting a grazing heifer he had mistaken for a deer. Thereafter he gathered around him a crowd of army deserters and other rough men who prowled the southern borderlands of Silesia, Moravia, and Slovakia. The “forest Adonis” was celebrated in folk song, and in folk legend which became practically indistinguishable from his biography. Throughout January of 1796, ad hoc courts tried upwards of 200 of his alleged associates in ad hoc tribunals in the Silesian towns of Wieprz, Zywiec, and Milowka. Overall, twenty-one were condemned to death and apart from one man, Blazej Solczenski, saved by intercession of a parish priest, all these death sentences were carried into immediate execution. * Several others from the deserter demographic were returned to the hands of the Austrian army for punishment up to and including death by musketry. * I assume that this reprieve is the source of the confusion among different texts reporting that Procpak was one of twenty robbers executed, or that those executed numbered Procpak plus twenty other robbers. The former is correct, although the executions were scattered across different days and sites; this source (Polish, like everything else) has the breakdowns with names and dates. 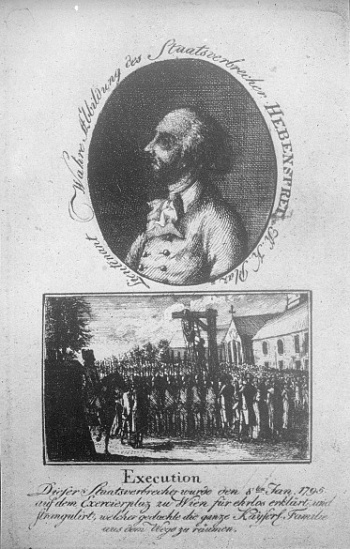 Vienna utopian Franz Hebenstreit, the world’s first communist, was publicly hanged on this date in 1795. Philosophy student turned cavalry officer and sometime poet, Hebenstreit along with Andreas von Riedel became in the wake of the French Revolution the foremost proponents of constitutional monarchy within the Habsburg empire. On this date in 1799, Neapolitan Republican Nicola Fiorentino went to the gallows. A precocious and multitalented scholar, Fiorentino (Italian Wikipedia link; almost everything to his name on the Internet is in Italian) was all of 19 years old when he obtained the professorship of mathematics at the royal school of Bari in 1774 although this honor was a bit delayed since he’d won a competition for a similar chair in Aquila when he had not yet attained the minimum age of 15. Instead, a speedy Bourbon reconquest clinched the other thing. Having held no office in the Republic he was ridiculously condemned for nothing but his prominence and the credibility his adherence lent to the republic. Fiorentino has the consolation of a present-day Neapolitan street named in his honor. On this date in 1793, Clément Charles François de Laverdy, Marquis of Gambais and the ancien regime‘s former Controller-General of Finances, was guillotined in Paris. “Un financier erudit,” Laverdy (English Wikipedia entry | French) was a member of the Paris Parlement and a scholar who at one point unearthed previously unknown manuscripts about the trial of Joan of Arc — but became a bit overmatched when political machinations situated him at Louis XV’s treasury. A physiocrat, Laverdy made a go in the 1760s at liberalizing the grain trade by authorizing via a July 1764 edict the free export of grain, then reaped the whirlwind when grain prices spiked. In the 1760s, the whirlwind just meant losing his job: by the 1790s, the loss was very much more dear. Laverdy correctly believed that traditional attitudes toward subsistence constituted the single greatest barrier to change. But, like many self-consciously enlightened ministers and reformers, he neither understood nor sympathized with it. Diffusing light, to be sure, was no easy matter; since all men were not equally equipped to seize the truth, often it was necessary to force them to accept it. To re-educate the public, Laverdy saw no alternative to brutal and relentless reconditioning. Only a tough, unbending stance would produce results. “By stiffening against the prejudices of the people,” he predicted, “they will gradually weaken and we will succeed in accustoming them to a bien,” though, he conceded, “they will continue to misjudge [it] for still some time to come.” Misjudging it, however, was one thing, and actively opposing it, quite another. The threat of bludgeoning them into submission was the only real incentive the Controller-General offered the people to embrace the liberal program. Two assumptions, in Laverdy’s view, seemed to have emboldened the people. First, that they could riot with “impunity,” an expectation encouraged by many police authorities — those at Rouen, for example — who fail to put down popular movements swiftly and mercilessly and who in some instances even seem to sympathize with the insurgents. Second, “the persuasion which the populace of the cities ordinarily shares that the fear of the riots which it might excite will force the King to modify the laws which established liberty.” Nothing was “more essential,” according to the Controller-General, than to “destroy” these aberrant opinions. 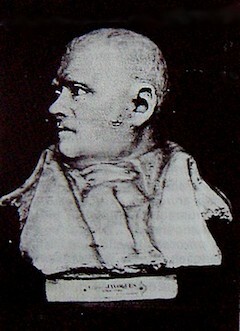 Napoleon’s private secretary on the adventure in Egypt, Louis Antoine Fauvelet de Bourrienne, claimed that Napoleon exaggerated for effect, and the executions were more in the neighborhood of a dozen per night. The beheaded corpses were stuffed in sacks and tossed into the Nile. Some time after the revolt of Cairo, the necessity of ensuring our own safety urged the commission of a horrible act of cruelty. A tribe of Arabs in the neighbourhood of Cairo had surprised and massacred a party of French. The general-in-chief ordered his aide-de-camp, Croisier, to proceed to the spot, surround the tribe, destroy their huts, kill all the men, and conduct the rest of the population to Cairo. The order was to decapitate the victims, to bring their heads in sacks to Cairo, to be exhibited to the people. 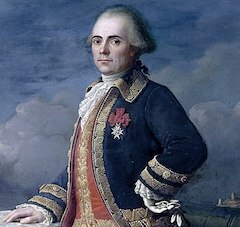 Eugene Beauharnais accompanied Croisier, who joyfully set out on this horrible expedition, in the hope of obliterating all recollection of the affair of Damanhour. Next day the party returned. Many of the poor Arab women had been delivered on the road, and the children had perished of hunger, heat, and fatigue. About four o’clock, a troop of asses arrived in Ezbekyeh Place, laden with sacks. The sacks were opened and the heads rolled out before the assembled populace. I cannot describe the horror I experienced; but, at the same time, I must acknowledge that this butchery ensured for a considerable time the tranquility and even the existence of the little caravans which were obliged to travel in all directions for the service of the army. French Revolutionary Claude Javogues was shot on this date in 1796. The son of an ancien regime royal castellan, the barrister Javogues would have the opportunity in the revolutionary Convention to vote the death of the old man’s boss, and he did not miss his chance. The guy wasn’t above getting his own hands dirty in the bloody work of revolution, either, and ran his own local revolutionary terror in his home town of Feurs. (A Chapel of the Martyrs in Feurs pays homage to the 80 victims of Javogues’s Terror.) Even so, he had his own brush with the Committee of Public Safety and stood in some danger for a time of being one of the children devoured by the revolution. Instead, it was the subsequent Thermidorean Reaction that did for Javogues when he was suspected of complicity in the radicals’ Conspiracy of Equals. He had the distinction in parting to be shot by a firing detail commanded by one Leopold Hugo — eventually (come 1802) the father of one Victor Hugo. On this date in 1799, a nobleman turned republican was turned into a martyr. Fruit of the distinguished Carafa family, Ettore Carafa (English Wikipedia entry | Italian) was the Count of Ruvo but preferred the ennoblement of all mankind. After a youthful trip to Paris on the verge of the French Revolution, Carafa returned to make himself the scandal of the Neapolitan aristocracy by such behaviors as translating the Declaration of the Rights of Man and of the Citizen and wearing the republican tricolor to the opera. Carafa was eventually obliged to break out of prison and take sanctuary in the Cisalpine Republic but he returned in glory (and no little satisfaction) with the 1799 Parthenopean Republic, when Naples briefly went republican, too. Commissioned an officer in revolutionary Naples’s army, he besieged his hometown of Andria. Carafa was one of its last holdouts, defending Pescara from siege well after Naples itself had fallen. 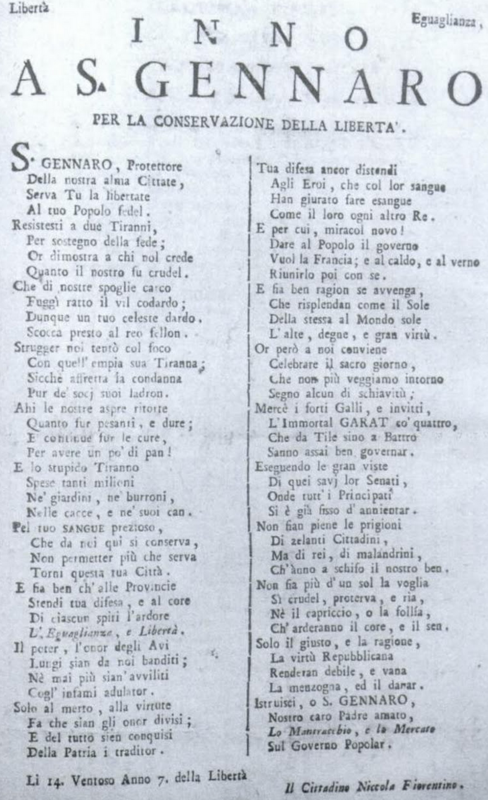 On September 4, 1799, Carafa mounted the guillotine with aplomb, his last words a command to the executioner Tommaso Paradiso, “You will tell your queen how a Carafa can die!” Then he slid himself under the knife on his back, boldly looking up at the instrument of death as it crashed through him.